The stories There are 21 products. These 80 patterns, of every conceivable different size, each tell the special story of needlework. The different patterns are organised into four harmonious styles and every seamstress can embroider her own special story: there are floral, countryside, retro and vintage styles. Now you can put your own personal touch on your accessories ! A little mouse, a pony, a duckling, a hamster or a baby rabbit – no fewer than 53 charts that each tell a sweet little story about our 20 favourite animals. From the Atlantic to the tropics by way of the Mediterranean : it’s a great story told in 50 cross-stitch patterns that invite you to set off on a wonderful sea voyage. These creations, inspired by the love of the briny, are an absolute must for your seaside house, for your boat or for beach-bags for everyone at home! The charts, both little and big, will allow you to embroider some simply ravishing work. Tea-towels, jam-pot labels, oven gloves, food baskets, boxes of sweetmeats, etc. …. 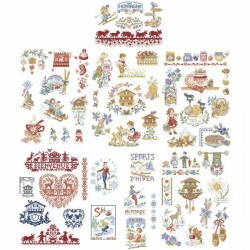 Your cross-stitch embroidery will add that special touch to a hundred and one different objects. To put it simply, this special story is simply delicious! On the sea shore or wrapped up in snow, on the school benches, behind the stove in the kitchen, under the Christmas tree or lost in the wilderness, Perette’s tiny characters are having fun while providing us with 50 creations waiting to be reinvented. This story is told with 50 embroidery cross stitch designs. 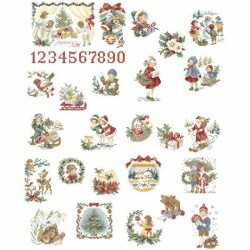 Small and big patterns, ABC and numbers will help you to decorate all the birth chards, bedroom sets, small toys etc. You can also customize baby’s clothes and other small items. A must for all birthday customized gifts! These very pretty patterns come in a wide choice of colours that can embellish your cushions, travel rug, curtains, the decorative edging to a shelf or a special piece of embroidery to welcome your friends to your home. You can take a charming stroll amongst peaks and Alpine pastures and let your creative talents really take flight. With these 25 patterns of different sizes you can encourage both young and old to be patient by offering them a little present every day coming up to Christmas. Give free rein to your imagination and surprise the whole household!